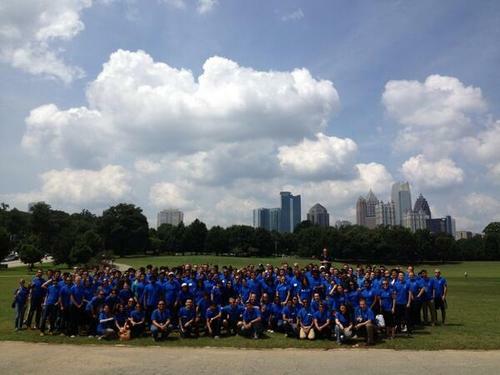 GBS Class of 2014 sits for a group picture at Piedmont Park after a day of service. 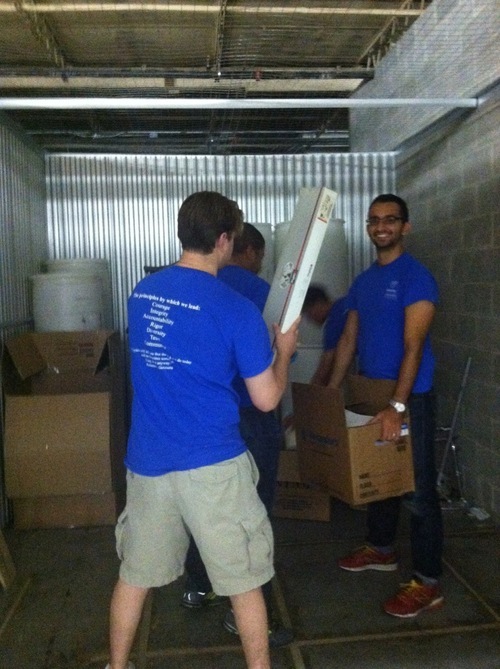 Students volunteered at various Atlanta organizations. Every year at Goizueta Business School, second-year, Full-Time MBA students return to campus, with a little more bounce in their step, holding their heads a little higher. With summer internships behind them, students are more confident in their abilities. While all of them have gained valuable knowledge and skills from their internship experiences, not all students come back to school with a clear idea of what they want to pursue. Some may even be a little more ambivalent. One elated group returns with full-time offers, another anxious bunch await full-time offers; some consider joining other companies, while others realize they want to switch their tracks altogether. Thus, after seeing excited Facebook posts and hearing success stories on blog entries the last three months about students’ amazing summer internship experiences, it was a relief for some to know that even as we all come back into our second year, some people are still trying to figure it out—and that’s okay. Keystone, a series of weeklong annual re-orientation events to integrate all of Goizueta’s MBA cohorts, helps put all of this into perspective. This year the theme of Keystone was about the importance of planning your route. While it is okay that some people may still be undecided, you should start developing a clear idea of where you want to go and the path you will use to guide you, to avoid facing pitfalls, saidAssociate Dean Brian Mitchell @DeanBrianGBS, who himself suffered a fall and subsequent femur fracture during a misdirected bicycle ride this summer. Dean Brian, who likened his experience to our own, said if he had planned his bicycle route, he would not have been distracted by his GPS and could have avoided the serious fall. Similarly, GBS students should figure out where they want to be in the next year, next five years, next ten years, etc., and actively take the steps necessary to get there. The first day of Keystone included three breakout sessions: in one, we were asked to work in teams to identify what we had learned from the last year and what we hope to gain in the coming year. In this session, students expressed how the core and management practice curriculum challenged and stretched students’ abilities beyond what they thought was possible, and how the diversity of the program’s students have helped them in their learning along the way. Looking ahead, students agreed they wanted to use their second years to take classes outside of their comfort zones to acquire new skills, be more involved in giving back to the GBS community, and to spend quality time with their fellow classmates. 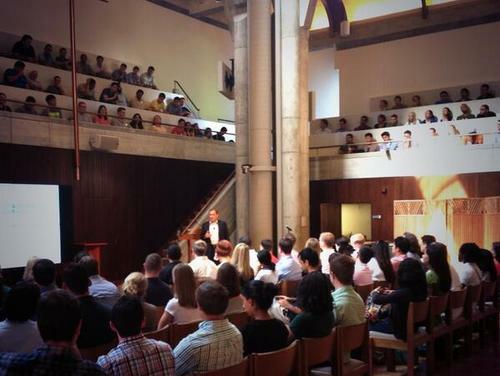 In another session, students were involved in a Q&A with Goizueta alums. Former students said the Goizueta experience allowed them to think more analytically and to better handle ambiguity in the workplace. It’s always hard to conceptualize and break down large, complex, and undefined problems on-the-job, they said, but the frameworks and tools taught at GBS helps make it a little easier. Alumni advised students to make the most of their second year to forge lasting friendships— a strong professional network in itself. Finally, a third session with Associate Dean and CMC director Wendy Tsung @Wendy_Tsung helped students reflect on their internship experiences and where they wanted to go from there. Students broke out into four groups depending on where they felt they were, including: Searching, Restless, or Zen— completely content with where they were, This session was eye-opening, because it was clear that there are still a large portion of students who want to fine tune their job search and pursue their passions in a more focused way. But across all groups, common themes emerged: students wished to continue to build their networks and be informed by learning about new companies and industries. At the end of the day, we were presented a final lecture by Goizueta’s new Associate Dean of Leadership Development Programs Ken Keen, a retired three-star military general. Keen has previously served in the Middle East, and has also been a key mentor on the Goizueta Advanced Leadership Academy mid-semester module. Keene’s experience and skills make him a fitting choice to direct Goizueta’s leadership programs. Students listen to a lecture by Goizueta’s new Associate Dean of Leadership Development Programs Ken Keen, a retired three-star military general. In line with that leadership, service is also a key component of what it means to be a Goizueta student. To that end, the second day of keystone was devoted to serving the local community. Groups of students dispersed through Atlanta to help various nonprofits with different missions: some were dedicated to providing resources to abused women and children, some were some supported environmental issues, some were dedicated to the arts, and some were to help the indigent or disadvantaged in need. My group was sent to Embraced, a nonprofit that collects and redistributes gently-used orthopedic medical equipment. Our site director, Raoul, explained how expensive something as simple as an ankle brace can be, so Embraced’s mission was critical to help those in the local community who can’t afford such devices. My group volunteered with Embraced, a nonprofit that collects and redistributes gently-used orthopedic medical equipment. Finally, the last day of Keystone at the end of the week was used to inspire students to give back to their own communities upon graduation. Even after we all receive our degrees, we were encouraged to support Goizueta so that future students can continue to enjoy the rigorous curriculum and advanced resources that the school has to provide. Through all of these events, my favorite part of Keystone was that these activities involved a mix of first-year, second-year, one-year and international students. It was a wonderful way to integrate us all and help break the ice with the peers we will be working alongside in Goizueta’s courses and various clubs. Overall, Keystone was a great way to mentally get us all into gear: to plunge into the second year with classes we are both interested in and which we expect to challenge us; to be more involved with Goizueta’s community, both through social events and to give back to the school; and above all, to help us keep focused on the end goal so that we don’t stray to far from the paths we have set for ourselves.